In Naha on April 6, chief editor, Toshiaki Nakahara (left) and the editorial staff promoted the book, saying, "The book summarizes the history of human rights in Okinawa." To mark the 50th anniversary of its establishment, the Okinawa Human Rights Association, which was established when Okinawa was under U.S. military administration and has since been involved in the protection of human rights for the people of Okinawa, has published the History book of human rights in Okinawa after World War II through the Kobunken publishing company. The book will be sold at bookstores in Okinawa from April 13 and covers citizens’ human rights movements in set periods. 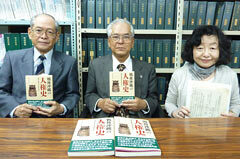 Editorial staff recommended the book, saying, “It summarizes the history of human rights in Okinawa. We would like people ranging from students to senior citizens to use it as a handbook for human rights.” The price is 2415 yen including tax. The book describes Okinawa after World War II as a place where there was no constitution because neither the Japanese Constitution nor the American Constitution were applied at that time. The Association, which was formed as a safe haven for people whose human rights were abused, handled many cases. They included cases related to matters such as U.S. military forces’ thought investigations, travel bans and disenfranchisement in Okinawa. The Association received notification of 130 cases in the first year of its establishment and the book describes how the Association scrambled to appeal to the relevant authorities.